The combined use of parking protected and kerb protection at junctions is highly welcomed. The criticises of the project comes partly from fear and a misunderstanding. First a misunderstanding that there’s one protected route nearby so no others are needed — this is not the case, a dense network of cycle routes is needed to make cycling safe and attractive. And when a city builds attractive cycle routes it builds them not just current cyclists, but a wide-range of people who will take up cycling when it safer and nicer to cycle. The rest of this submission should be please viewed as constructive criticism which can help with detailed design, not a criticism of the project overall. For anybody in fear of or otherwise not understanding parking protected cycle routes — such designs seeks to protect people of all ages cycling rather than having those people be a buffer between parked and moving cars. The design is common and used increasingly in cities of different sizes — including Cork, London, New York, Copenhagen, Amsterdam, Utrecht etc. The objection to the project from one residents group should be seen in the context of the same happening in other countries on parking protected cycle lanes and in Dublin with other projects which change streets. Councillors, officials, and members of the public are advised to read about the Prospect Park West protected bike lane saga which at one point nearly derailed the New York City bicycle network programme. See: https://nyc.streetsblog.org/2016/09/22/good-riddance-to-the-prospect-park-west-bike-lane-lawsuit/ — it’s the story of a small number of well-off residents who did not want changes for the better of society on “their street” and they flung muck at the project hopping something would stick. More generally it should be noted that similar groups and individuals around the world who are against giving safe space to cycling also claim that they are “pro-cycling” or at least are not anti-cycling — these people should be judged on their support or lack of support for cycle routes which are suitable for all ages, including children, retirees and people less than the average physical ability. The size of the traffic lights should be reduced to at most 3.15 metres to reduce speeds and provide safety for all users, while allowing ofr extra space to be added to the buffer between the car parking and cycle lane. While the council has not stated what traffic light sequences it intends to use, it should be noted that it is highly desirable that Dublin City Council does not attempt use or trial conflicting green lights (ie where the cycle lane has a green light for straight ahead movements at the same time as the left turning general traffic lane) on the above mentioned junctions . Conflicting green lights are generally viewed as not acceptable in Irish and UK law and are no longer recommended for use in The Netherlands due to the safety risk. Two junctions — where Fitzwillam Street meets Baggot Street and where it meets Merrion Square South have the look of “protected junctions”, but it needs to be stressed that there’s some major key differences between these junctions and the Dutch junctions which they look similar to. The main differences include: (1) the need to have stopping lines / bicycle traffic light locations where the cycle path intersects with the roadway, (2) removing the pedestrian / cycling interaction so that it is outside the traffic lights sequence, and (3) having waiting space for pedestrians between the cycle path and the roadway and this in turn gives more space for the interaction between people cycling with other cycling and people cycling and driving. If these differences cannot be addressed an alternative design should be looked at — it may be dangerous for different user types to proceed with the junction design without following the design principals followed with this type of junction in the Netherlands. There is also a lack of clarity of what traffic light signal sequence will be used. Without the council outlining what traffic light sequences it intends to use it is hard to fully evaluate this junction design. The principal of keeping cycling segregated is good, but some detail of signaling is unclear. For example, without a stop line in the location below highlighted in yellow highlighter, will some users try to cycle in the direction of the green line and arrow, conflicting with motorists making the turn shown in blue. Is is unclear without more information. 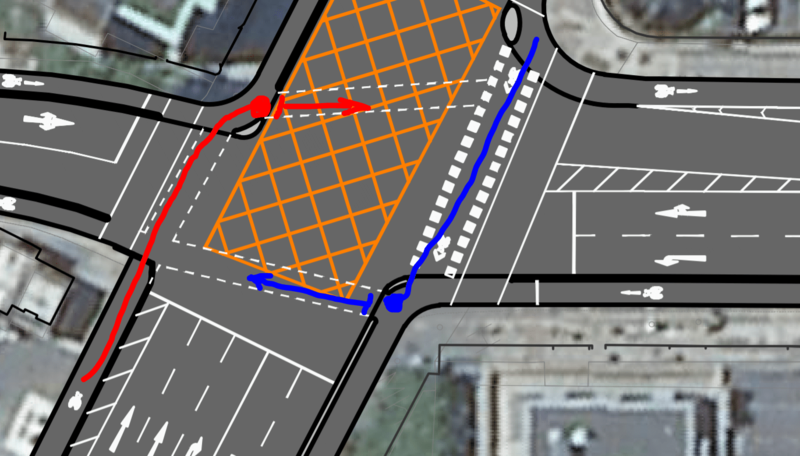 As with the previous junction, without the council outlining what traffic light sequences it intends to use it is hard to fully evaluate this junction design. 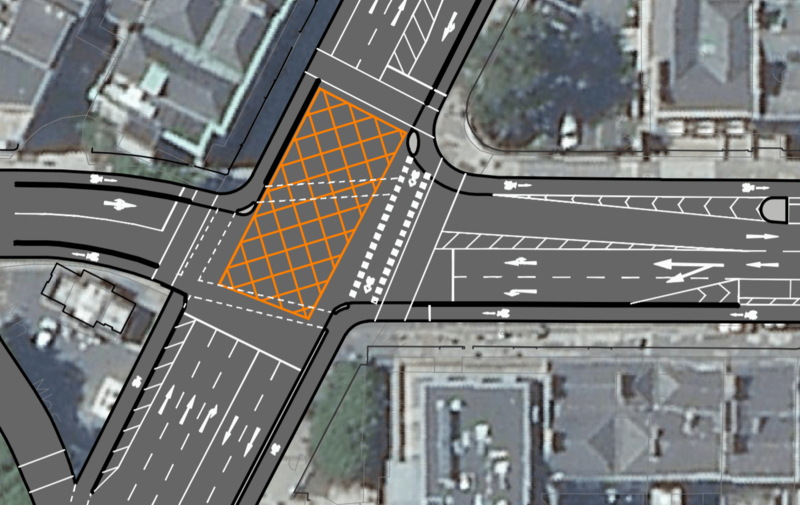 The buffer space between general traffic lanes from at the Leeson Street / St Stevens Green direction (top of the image) would likely be better used as (a) a left turning lane or (b) to be shifted to the other side of the street to be used as a right turning lane within a protected cycle lane. 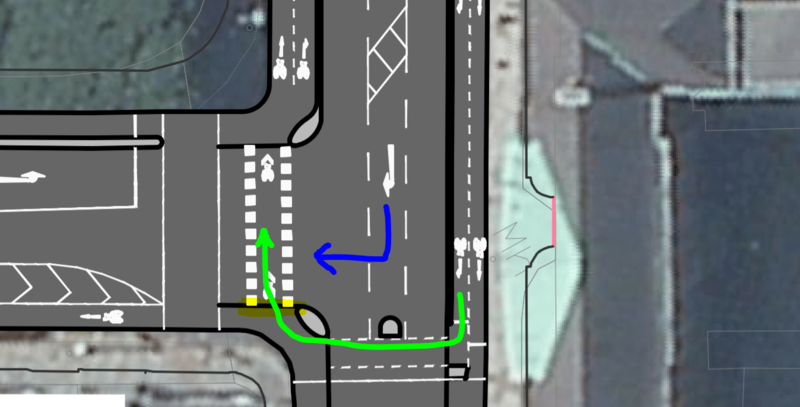 With the current planned design, is there enough space to allow for cyclists to wait / stack and others to continue straight on? Where there are raised crossing / junction tables, these should extend across the full junction and/or crossing for greater safety. It is highly questionable in safety terms for the council to plan to aid people crossing the cycle lane with a ramp at crossing points but then leave people exposed to car, trucks and buses without any aid when crossing the main carriageway. Also: There are fairly frequent junctions on the street, so, it is not fully clear why mid-block crossing points are provided — it would be better for pedestrian and cycling safety to provide higher-quality crossings with raised tables at the junctions. Usually IrishCycle.com would be looking of more access for cycling, but in the case of access points to the DublinBikes and bicycle parking, pictured above, it would not be unreasonable to remove the mid-block bicycle crossing points and let people rely on the junctions crossing points. As with pedestrians, higher-quality crossings points at junctions would be better for all. To add to the last point, the scheme also includes good examples of turning points which are away from junctions and thus much more needed. These examples, as shown above, are to the Merrion Square East DublinBikes Station and to a laneway which provides access to off-street parking. These should be retained. 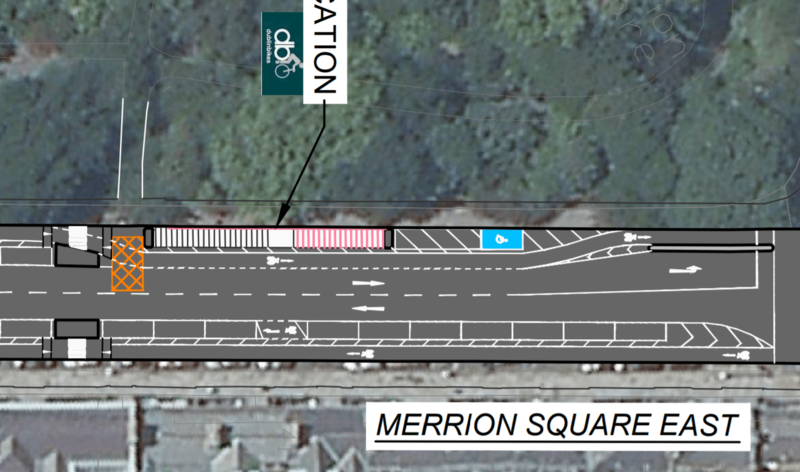 Ideally the lack of segregation at Merrion Square East DublinBikes should be addressed by moving the DublinBikes station so that it is placed between the carrageway and the cycle lane. Alternatively, the lines highlighted in yellow above should become kerbs or bollard-protected. 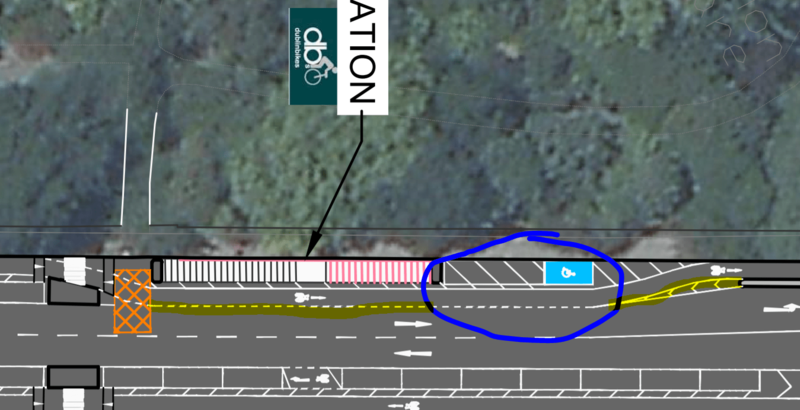 The hatching / buffer space between the cycle lane and the DublinBikes should shifted so that it is between the cycle lane and the main carriageway. The area circled could remain as access of DublinBikes vans / pickups and to the disabled space. The scheme is much welcomed and while there are some detailed design issues, none of these should be show stoppers. Excellent research and information. Well done to the writer.